You're reading the blog of Vincent Cabansag. The third week of Code Academy was full of new material as we were were introduced to the complexities of database schema and nesting relationships. We created several models that were related to one another in both One-to-Many and Many-to-Many relationships. Jeff Cohen added the wrinkle of nesting, which led to some serious adjustments in the code. We had a some challenging labs trying to figure out out to reflect the nested relationships in our models, controllers and views. Learning how to create a relational database with many tables will be very important in our web applications. I'm glad that I have working knowledge of tables, keys and database schema. It helped me push past database conceptualization and focus on writing the code to implement the different relationships. I have to say that Active Record is awesome! I have no working knowledge of SQL queries and Jeff pointed out that the lack of SQL expertise was a barrier to entry for web application development. But with the advent of Active Record, he compared it to a "black hole" that he could simply not resist. This week, I got to pair with the eclectic Alfonso Rush and Cesar Pereria. Both were great pairings and I look forward to new pairings this week. Our instruction was altered this week as we now have lecture without using computers. Jeff introduces concepts, demonstrates them in an application and then we start our lab. I like this approach as it makes me focus on the higher-level concepts and allows me to jot down notes without having to write any code. When we start the lab, it's a much richer learning experience as we need to go through a thought process and write the appropriate code. Thanks to Neal, Mike and Jeff for always taking our feedback into consideration! 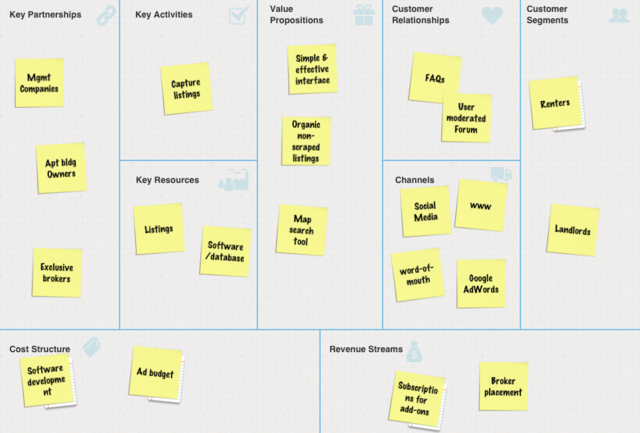 We presented our business model canvas on Thursday last week. I really enjoyed the book Business Model Generation by Alexander Osterwalder and chose to go with the business model canvas rather than the lean canvas. It was very interesting to see everyone's business model and how they plan to execute. There were some strong well-thought out models and some more conceptual and exploratory. A lesson to be learned is that when you're developing a product with the hopes of monetizing it, you absolutely need a sound business model. You also need to have the presence in mind to change parts of your business models as conditions change. I hope we can do more business modeling during the course of Code Academy, love it. I gave my notice to leave my job last week. I have been with Chicago Apartment Finders for almost seven years and, as a Managing Broker, I have surmounted a great deal of real estate experience and have developed strong professional and personal relationships. I've been transitioning myself out for sometime, but the time has come to complete that transition. I have left a great mark on CAF and, more importantly, the people whom I have worked with over the years have their mark on me. I am grateful to have been part of the best apartment broker in Chicago. With this change, also comes a new drive and a hunger to succeed. I'm happy to say that I've "emptied my cup" and can now make the most of Code Academy.